Middle East District Cooling Market size for 2016 was valued over USD 6 Billion and the capacity is set to exceed 17 Million RT by 2024. Extreme climatic conditions with relatively high temperature will drive the district cooling market size. Increasing average surface temperature due to growing greenhouse gas emissions is set to accelerate the product demand. In 2016, maximum recorded temperature across Kuwait reached to 540C which was 8% higher when compared with 2015 level. 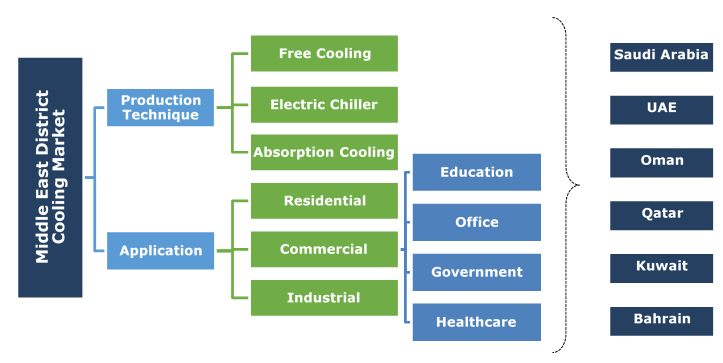 Growing adoption of sustainable cooling technologies to fulfill energy conservation targets will foster the district cooling market share. Shifting trends toward optimization of energy efficient conditioning will further boost the product demand. In 2014, the Government of Dubai setup a target to reduce building energy consumption by 20%, by 2030. The government of Abu Dhabi in line with its Vision 2030 formulated a program named Estidama, which regulates construction, design, operation and performance of buildings, villas, and communities. Rapid urbanization along with growing infrastructure spending across GCC countries will drive the Middle East district cooling market. In 2017, the Government of Dubai increased its infrastructure spending by 27 percent when compared to its allocation for the year 2016. In 2016, the Government of UAE has also set a budget of USD 4.62 billion towards infrastructure development till 2020. Electric chillers in 2016, accounted for over 50% of the district cooling market share. Convenient distribution networks coupled with feasible operational cost and low electricity prices are the key parameters which will favor the technology adoption. 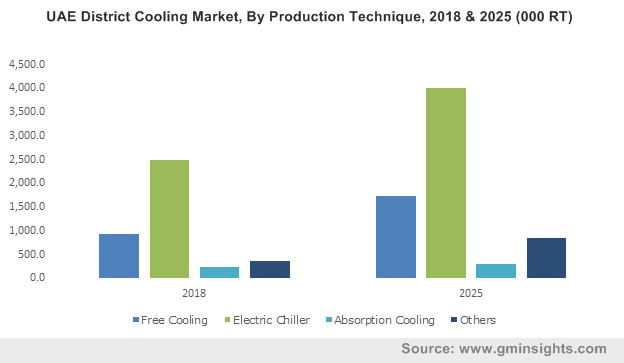 Free district cooling market will witness strong growth owing to growing measures toward reduction of fossil fuel dependency. These systems involve direct extraction of cold water from water bodies including seas, lakes and other waterways. Ongoing development of high capacity projects including Bahrain Bay DC plant with an aim to reduce GHG emissions by utilizing seawater as a cooling medium will further complement the industry outlook. Commercial district cooling market is predicted to exceed over 8 million RT by 2024. Increasing private investments towards the development of energy efficient commercial building structures to facilitate the daily needs of growing urban population will fuel the business growth. In 2015, Qatar Cool, expanded its DC plant in Doha's West Bay neighborhood that features Qatar's tallest skyscrapers, high-end offices, housing luxury apartments and hotels. Residential district cooling market will witness strong growth owing to escalating energy prices along with growing in urban population. In 2016, Emicool, announced its plan to increase its DC plant capacity to 500,000 RT by 2020 as a part of its Dubai Investments Park expansion. Saudi Arabia district cooling market size in 2016 was valued over USD 1.5 billion. Rising demand for energy efficient cooling systems to facilitate with green building standards will stimulate the industry size. Increasing commercial and residential construction activities across prominent cities of Mecca and Riyadh coupled with favorable government initiatives toward deployment of DC systems will further complement the industry landscape. In July 2015, Mitsubishi Heavy Industries received an order for DC plant for 80 units of centrifugal chillers related with a development project in Medina. The plant is likely to provide 200,000 RT to an area of 1.6 million m2. Stringent government norms toward development of sustainable energy will embellish the UAE district cooling market. In 2015, the government of Dubai has set its goal to achieve 40% of cooling demand through DC systems by 2030. The target aims to reduce the power consumption of the city’s air conditioning by 50%. Qatar district cooling market will grow owing to ongoing infrastructure developments. The country has invested a large amount over the past few years toward the development of required infrastructure for hoisting the FIFA 2022. Qatar has formulated plans to draw an amount of USD 222 billion by the year 2022 for development of infrastructure projects including hotels, stadiums, and other transport facilities. Notable players operating in the district cooling market include Emirates Central Cooling System Corporation (Empower), Stellar Energy, Emirates District Cooling (Emicool), DC Pro Engineering, National Central Cooling Company PJSC (Tabreed), ADC Energy Systems, Qatar Cool, Marafeq Qatar, Shinryo Corporation, Logstor A/S and Siemens. Industry players as a part of strategy are focusing toward product customization and expansion of production facilities to meet the growing demand at competitive price. DC systems delivers chilled water from a centralized location to multiple buildings through an underground network of insulated pipes. The water circulates through refrigerating coils and enters the air conditioning system. The energy required to drive the chillers can be produced from multiple sources consisting electric chillers, steam turbines, waste heat from industrial processes and free cooling. These products are easy to maintain, produces less noise, controls the internal temperature of buildings efficiently and consumes less power in comparison to other alternate cooling technologies.